Layout templates are packaged in special Jetspeed-specific and deployable portlet applications. Layout templates control the overall aggregation of a portal page. Layout templates are combined with portlets, providing a component model for aggregation. Jetspeed-2 comes out of the box with several layout components including one, two and three column layouts. See the Jetspeed-2 Layouts below for all available Layouts in the default Jetspeed-2 system. Of course you can define and derive your own layouts. With regards to aggregation, layouts define how a single portal page is aggregated. A l ayout defines the fashion in which grouping of fragments will organized relative to the final, aggregated content of a request to the portal. 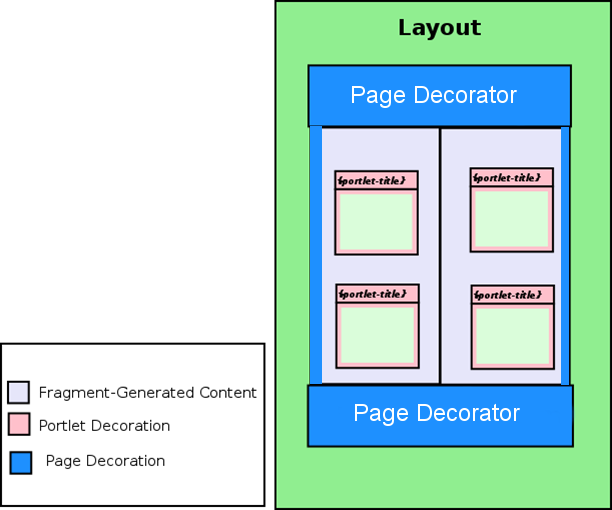 Layouts are defined by a portlet which applies an algorithm to a template to generate the aggregated content of a page. Typical algorithms are two column, three column, nested. Jetspeed-2 comes out of the box with several layout components including one, two and three column layouts. Of course you can define and derive your own layouts. The table below lists the available layout components in Jetspeed. When customizing (editing) a page, the layout component is selected. One layout may be assigned per PSML page. VelocityOneColumn OneColumn 1 100% view,edit,help A single column display of one or more fragments taking up 100% of the portlet display area. VelocityTwoColumns TwoColumns 2 50%,50% view,edit,help A two column display of one or more fragments where each column is allocated to 50% of the portlet display area respectively. Fragments may be placed in either column using PSML fragment definitions. VelocityTwoColumnsSmallLeft TwoColumns 2 15%,85% view,edit,help A two column display of one or more fragments where the left column is allocated to 15% of the portlet display area, and the right column is allocated to 85% of the portlet display area. Fragments may be placed in either column using PSML fragment definitions. VelocityThreeColumns ThreeColumns 3 33%,33%,33% view,edit,help A three column display of one or more fragments where each column is allocated to 33% of the portlet display area respectively. Fragments may be placed in either column using PSML fragment definitions. VelocityThreeColumnsNoActions view Same parameters as their counterparts with actions, but no decorator actions are displayed.